If You Are Anywhere in Italy, Le Calandre Is Worth a Detour!!! Le Calandre is the best restaurant I have ever eaten in. No question about it. It was a few days ago, and I still can’t get it off my mind. SPECTACULAR. And I am not exaggerating. I was literally moved, in particular, by the clarity of the ingredients and the purity of the tastes in each individual dish. 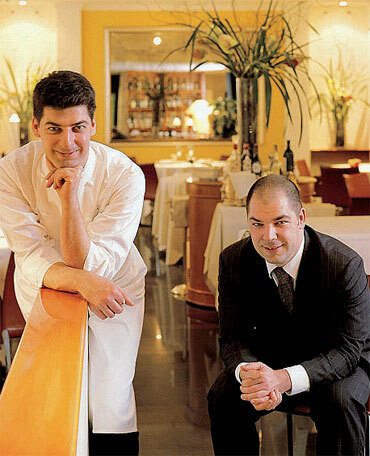 Massimiliano Alajmo is the chef and Raffaele is the manager, and they are the ultra famous brothers who established their home and restaurant near Padova, in a place called Sarmeola di Rubano. Despite the charming sound of its name, the area is a strip mall with supermarkets and car dealers. Do not worry! Go ahead! Enter the cathedral of Italian cuisine. Forget about the bill too. It’s all worth it. The staff is kind, patient and knowledgeable; the room very hospitable and elegant; the food, let me say it again, the FOOD is INCREDIBLE. Starting from the bread (only one kind of beautiful big country bread, no distractions – perfectly leavened and baked), all and each dish we had was memorable. To name a couple, the cappuccino di seppie nero is served in a cappuccino clear cup, the bottom of squid and the top of white potato foam You mix it and it turns brown as in a cappuccino. 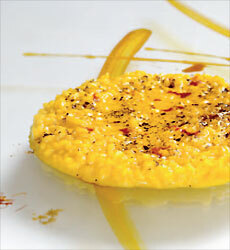 In the risotto allo zafferano con polvere di liquirizia, the licorice opens the taste buds in your mouth, enhancing the taste of the saffron. WONDERFUL! I was in Padova to visit the Molino Quaglia (see bread above – more on its flour later) and I can’t thank my new friend, Chiara Quaglia, enough for pulling strings to get us in. As a normal mortal, I would not have been able to have a table with such short notice. It’s good to have friends in the right places. Thank you all. Next Post Pasta Faella. It’s Time to Celebrate!!! Mouthwater indeed. I am really sure, I would swerve a little just for this.